P28 makes it easy to get a perfect balance of protein and carbs in every meal. 28 grams protein in two slices. 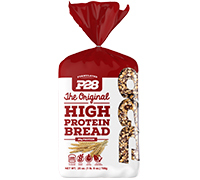 P28 is made with 100% Whole Wheat, 100% Whey Protein Isolate, Oats, Flaxseed, Sunflower Seed and Millet. P28 contains important Omega 3's, and is a rich source of 8 essential Amino Acids. This product also is cholesterol free and a good source of fiber. 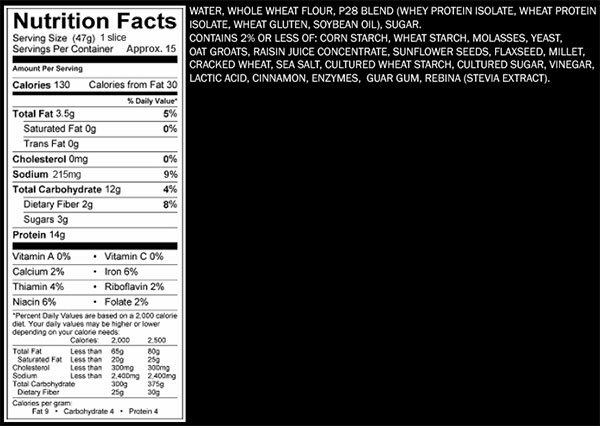 Whey Isolate is superior to all other forms of protein. It provides the body with the perfect Amino Acid profile for building, strengthening, and repairing muscle. Whey protein is the fastest absorbing type of protein available. It is perfect for when you wake up and for your post work out nutrition. At these times, your body is at its most catabolic state, and desperately needs the protein. Why not use the best possible protein available? Sunflower Seeds are a powerful source of vitamins & minerals. They are a rich source of Vitamin E, great source of Fiber, and for a quick burst of energy. Sunflower Seeds are also rich in magnesium, potassium, zinc, and iron. Flax seeds are very high in Lignans, which are known to help fight cancer. They are an excellent source of Omega 3 and 6's, which play a vital role in helping people with inflamation. Flax Seeds also play a vital role in the active tissue of your brain. They also control the way cholesterol works in your system. Flax Seeds help fight against diabetes, cancer, constipation, inflamation, menopausal symptoms, and heart disease. Millet is a heart health grain rich in the nutrients of manganese, phosphorus, and magnesium. The make up of this ingredient helps lower Type 2 diabetes risk. Millet also helps in the development and repairing of body tissue, and has heart protection properties. Sea Salt is unrefined and is made up of around 80 important minerals, such as Iron, Sulfer, and Magnesium. It has a great number of benefits to it because of these mineral composites. Sea Salt also helps to stabalize abnormal heart beats, which is contrary to the belief that it causes high blood pressure. Sea Salt is also known to dissolve kidney stones in the body. Also, Sea Salt helps to supply the body with essential minterals directly to your cells to inhance and improve the body's immune system. Sea Salt is also known to supply essential nutrients to the muscle which helps prevent muscle cramps. Cinnamon not only makes your food taste great, it also has many health benefits. Studies have shown that just a 1/2 teaspoon a day can have many positive health benefits such as lowering cholesterol, reducing blood sugar levels, and treating Type 2 diabates. Cinnamon also provides protection against heart diseases. Cinnamon also helps relieve muscle and joint pain. Cinnamon is also a great source of manganese, fiber, iron, and calcium. Raisin Juice contains high amounts of thiamin, niacin, folate, vitamin B6, vitamin B12, and other dietary minerals. It is a natural sweetner and natural perservative. Whole Wheat is considered to be a heart health grain loaded with antioxidants such as selenium, Vitamin E, manganese, and phenolic acid which all offer free radical damage to our cells. Whole wheat is also linked to keeping a healthy body weight, the prevention of galstones, and even a decrease in childhood asthma. Whole wheat flour is a complex carbohydrate that is digested slowly and provides longer amounts of sustained energy, keeping you on your toes all day long and keeping your mind off the next meal. For centuries, the GuaranÃ­ peoples of Paraguay, Bolivia and Brazil used stevia, which they called ka'a he'Ãª ("sweet herb"), as a sweetener in yerba mate and medicinal teas for treating heartburn and other ailments. More recent medical research has shown promise in treating obesity and hypertension. Stevia has a negligible effect on blood glucose, even enhancing glucose tolerance; therefore, it is attractive as a natural sweetener to diabetics and others on carbohydrate-controlled diets. Possible treatment of osteoporosis has been suggested by the patent application claim that eggshell breakage can be reduced by 75% by adding a small percentage of stevia leaf powder to chicken feed. It has also been suggested that pigs fed stevia extract had twice as much calcium content in their meat, but these claims have been unverified.